Waxing Gibbous Moon-Nine day old moon. 62% visible. I took this last night on the deck, I still can't get down the ramp because of the ice. Maybe today the rest of the ice will melt. 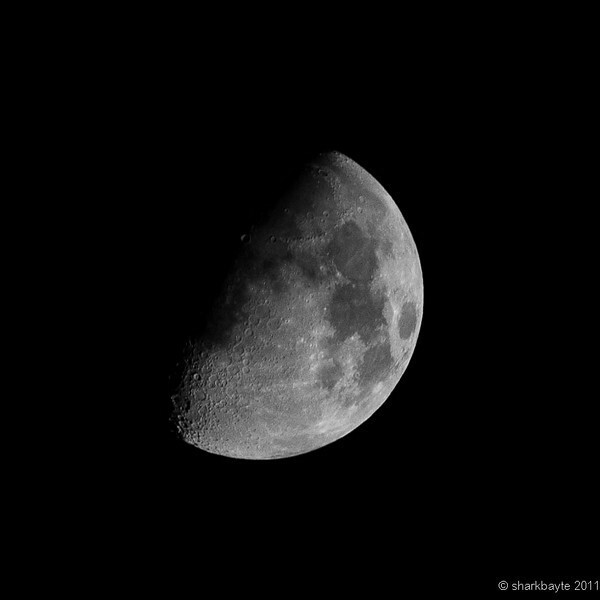 This is the first time I was able to get much more details of the moon. I didn't have a clear view as the trees limbs where in the way if I was able to get to open sky I think I would have been better. What SonoLady said -- it astounds me to think that this isn't a telescopic image but a digital camera instead! Love the detail here, and the exposure/contrast is perfect. Really feel as if I'm on the deck with you (just don't slide down it!). I LOVE moon shots and this one I especially like...the details and the dark contrast = fabulous!!! Hard to believe we can get details of the MOON!! still blows my mind, everytime.